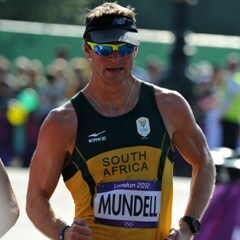 London - Marc Mundell has set a new African record in the men's 50km walking race, as he finishing 32nd overall in a time of 3:55:32. The event was won by two-time world champion Sergei Kirdyapkin, who claimed an Olympic record in the 50 kilometer race walk, the longest event in the track and field program. The victory gave Russia its fifth gold to further cement its second-place standing in the track and field medals table behind the overpowering Americans, who have eight. Walking through a glorious morning sunshine in 21 C (70F) heat at the Mall, in front of Buckingham Palace, Kirdyapkin crossed in 3 hours, 35 minutes, 59 seconds to slash 1 minute, 10 seconds off the Olympic record of 2008 champion Alex Schwazer, the Italian who was kicked out of the London Games because of doping. Australia's Jared Tallent finished 50 seconds behind to get the silver and Si Tianfeng of China got the bronze.